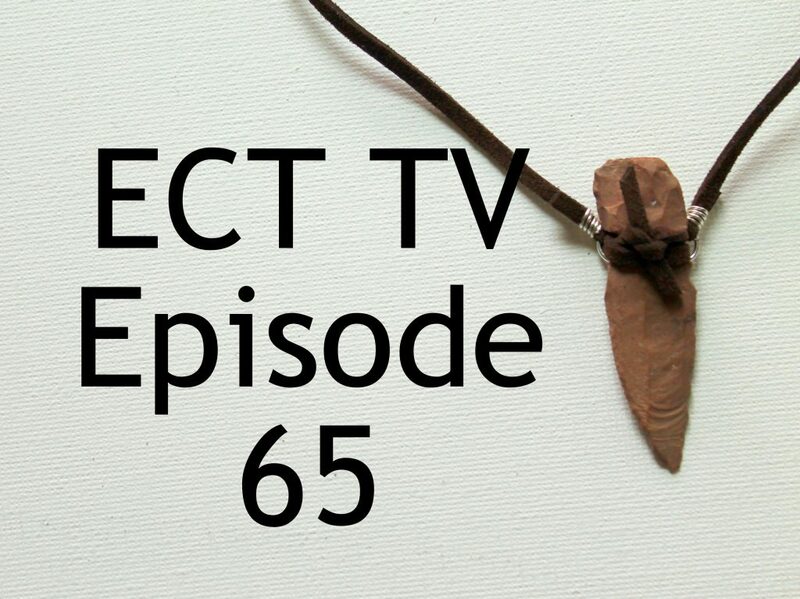 On today’s episode of Emerging Creatively Tutorials TV (ECT TV) I’ll show you how to make a simple necklace with an arrowhead, wire and leather cord. 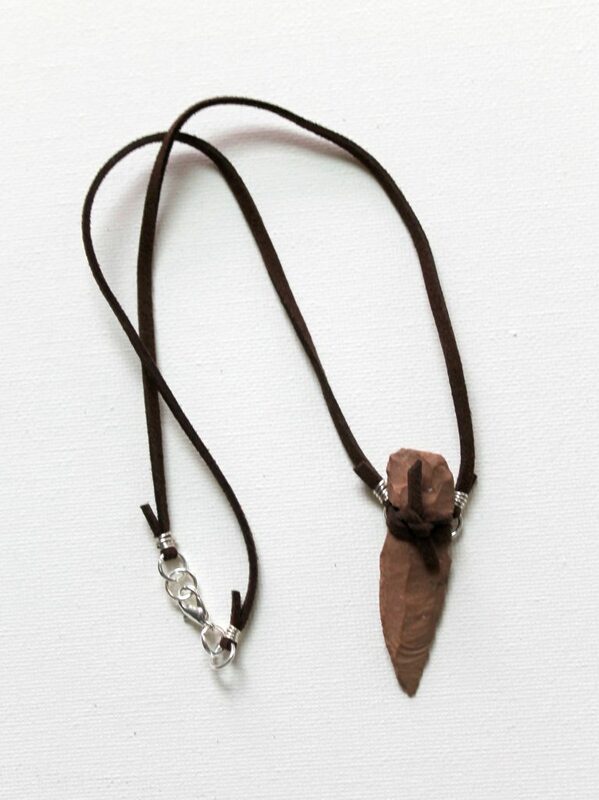 Even if you don’t have an arrowhead or do not wish to make an arrowhead necklace, you’ll find creative inspiration from my inspiration and a technique for crimping cord ends with wire. I am part Native American. I am just getting into tracing my family tree again, so I don’t have a lot of information, but from what I remember my grandmother telling me we’re from the Mohawk Tribe. During our trip we drove through a Mohawk Reservation, which was really exciting. 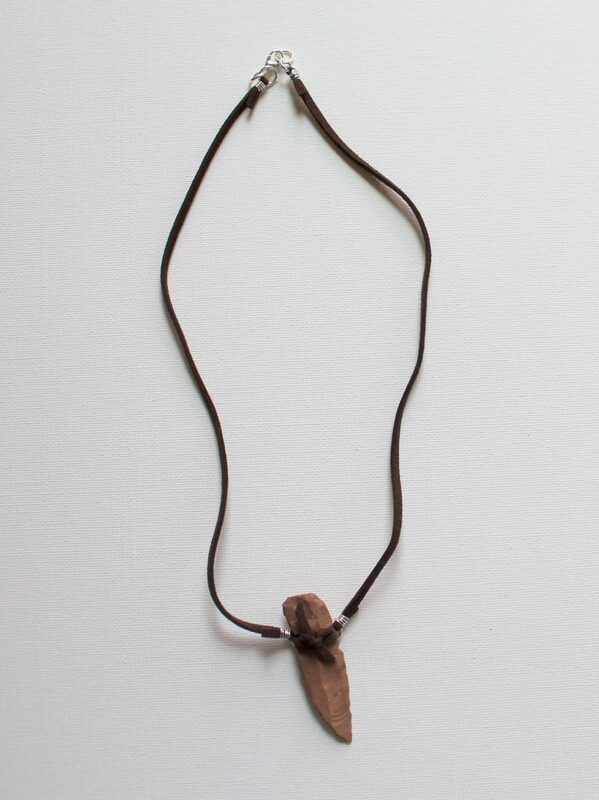 So this necklace is really about my heritage and also a souvenir from my trip. 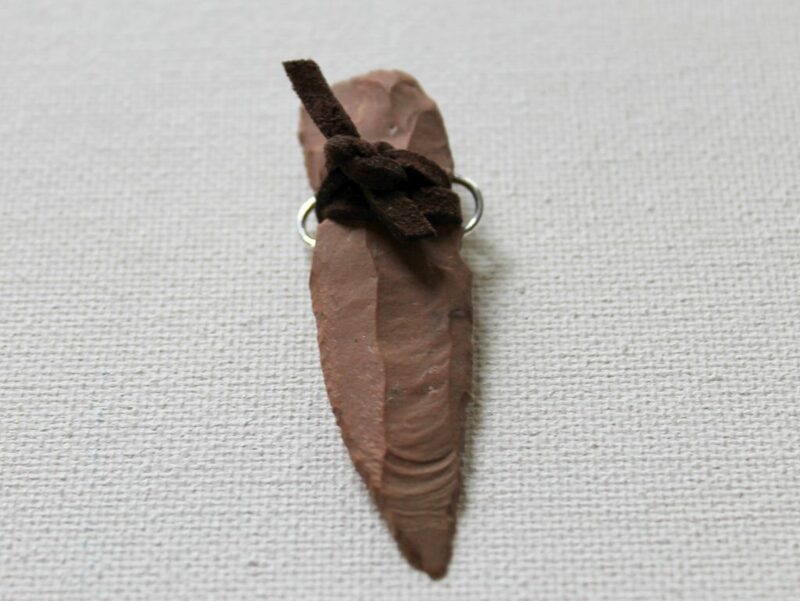 I invite you to think about your heritage and think about how you could incorporate that into a jewelry design. You might think about specific relics or symbols or perhaps colors or specific gemstones. How can you incorporate those into your design? Whenever you go on a trip, it changes you. You learn new things, see new things and experience new things. Think about a vacation or road trip you’ve taken. 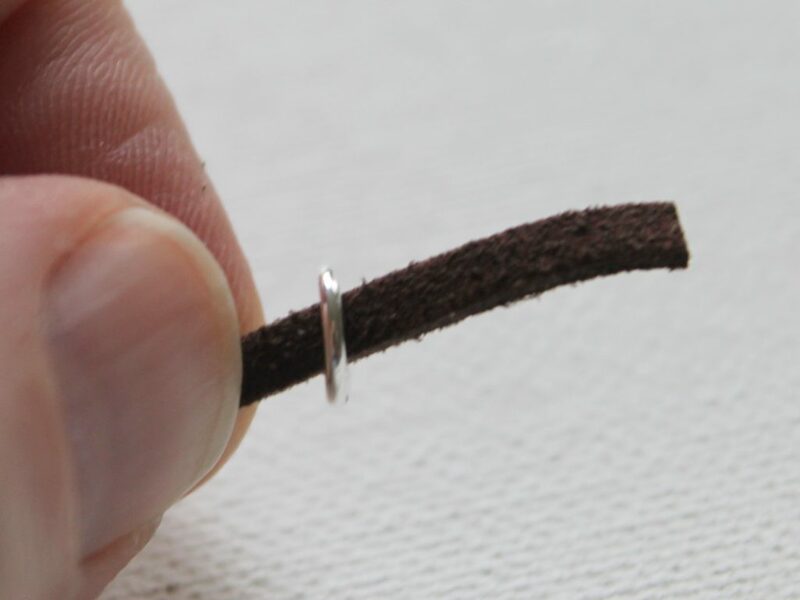 How could you reflect that experience into a jewelry design? 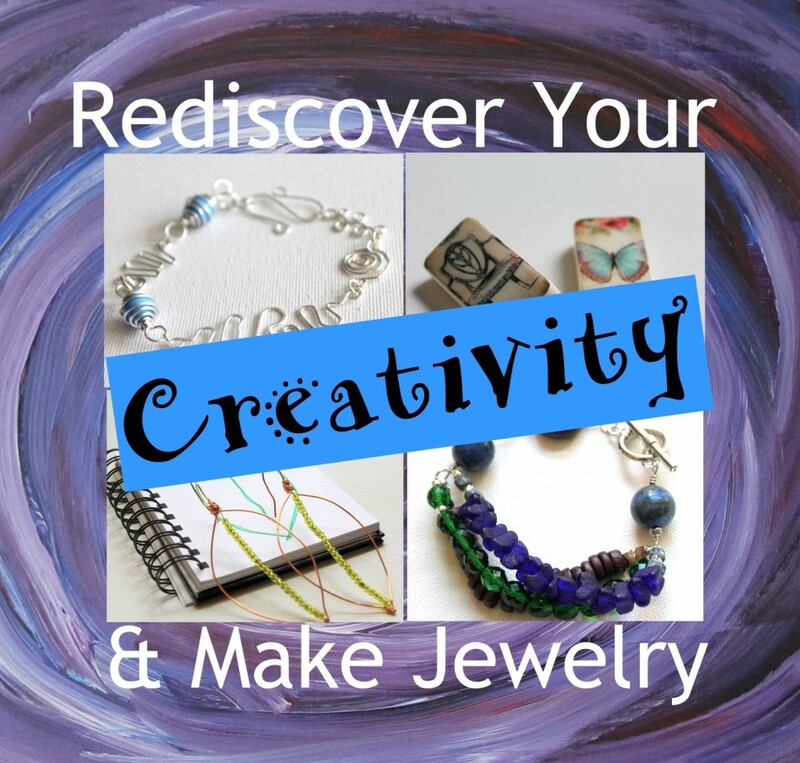 If you want to get a creativity booster, learn jewelry making skills and make a souvenir charm bracelet, check out my FREE Rediscover Your Creativity & Make Jewelry Mini eCourse. These are step-by-step photo instructions of the same tutorial that’s in the video. Cut 6 inches of cord. Thread 2 jump rings onto the cord. 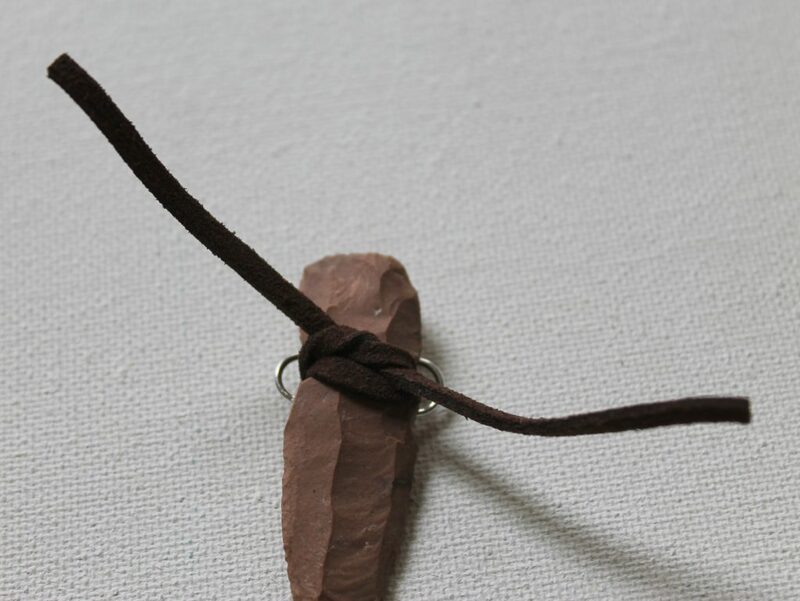 Wrap the cord around the arrowhead starting at the front and wrap around and cross it in the back positioning the cord in the notches in the arrowhead. Position the jump rings so they’re on the sides of the arrowhead. Wrap the cord back to the front and pull the ends through the jump rings on each side again. 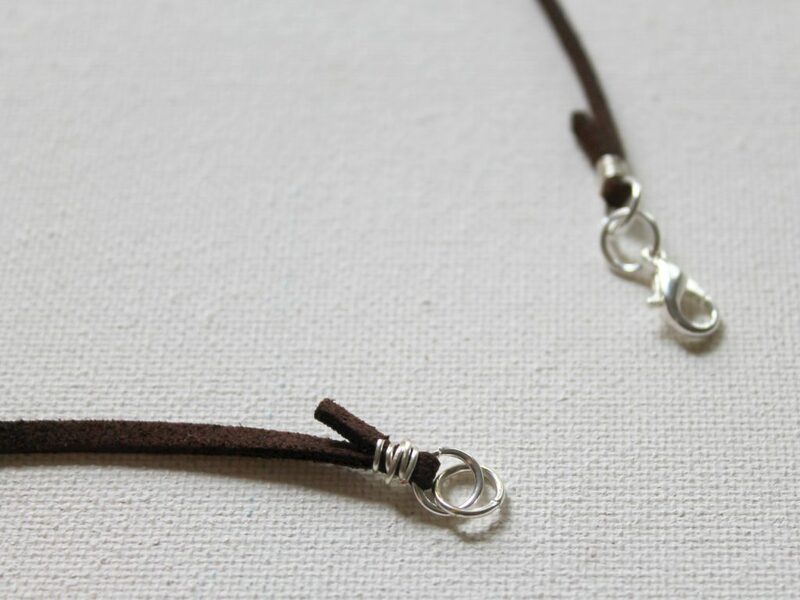 Tie the leather cord in the front. Pull the knot very tightly and make sure it’s secure. Alternatively, if you don’t like the look of tying in the front, tie it in the back instead. Cut about 4 inches of 22 gauge wire. 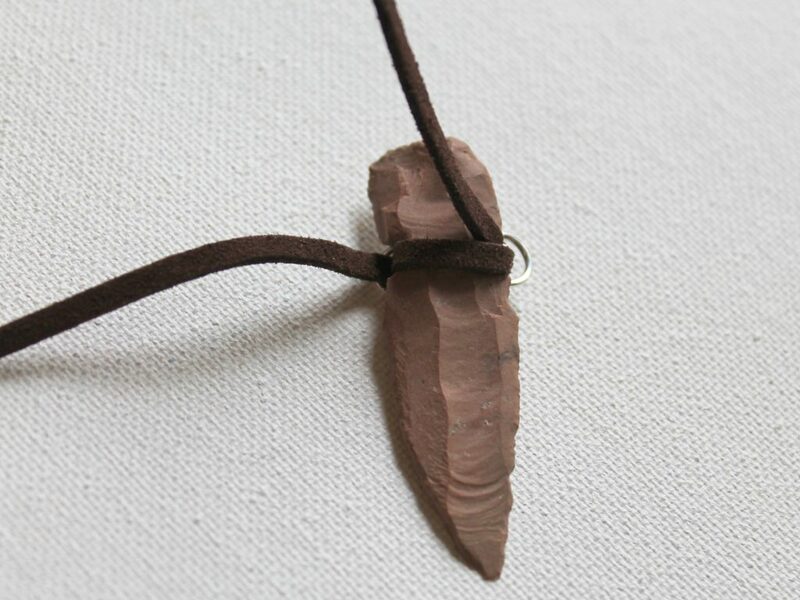 Now we’ll add the necklace part to our arrowhead pendant. 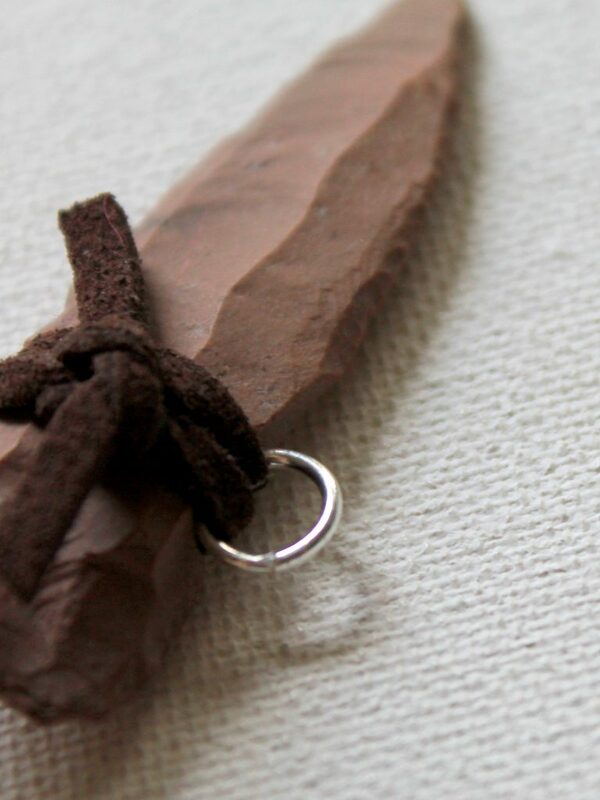 Pull leather cord through one of the jump rings on the side of the arrowhead. 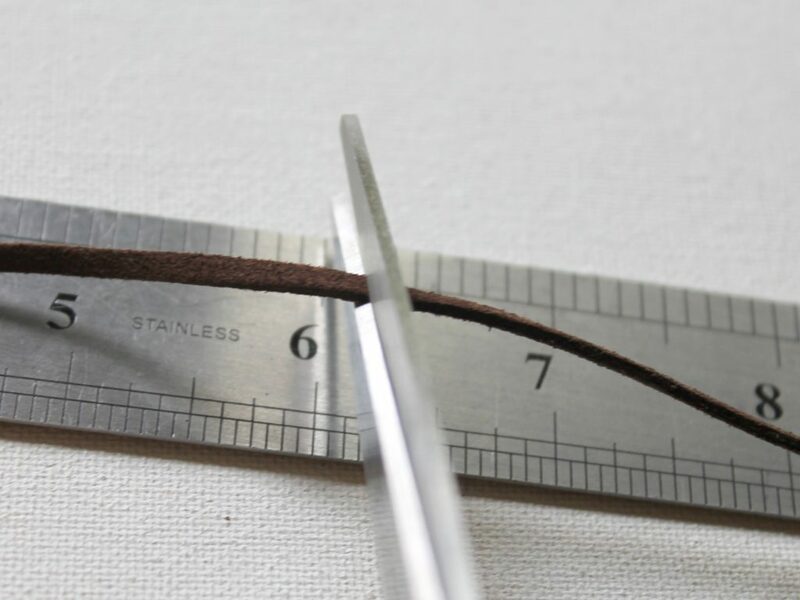 Fold the leather over making about an inch and a half overlap. 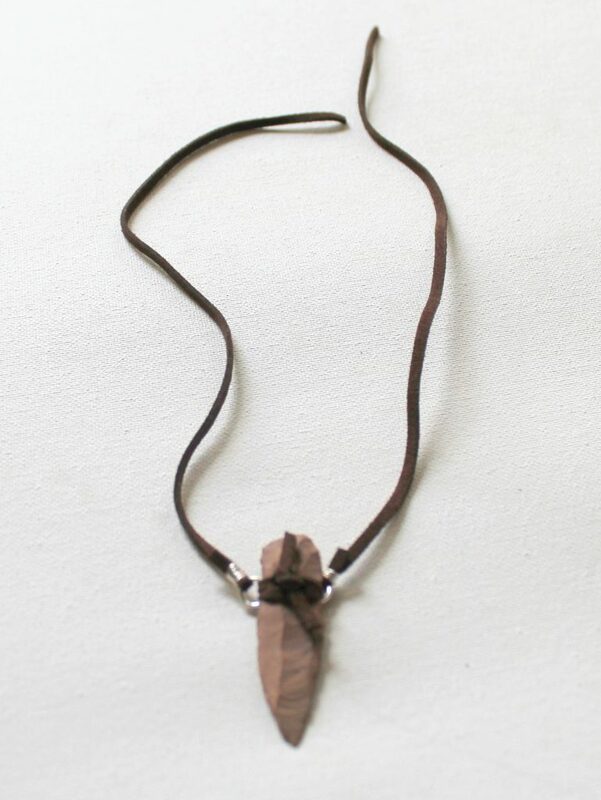 I like to have the overlap on the front of the necklace because I like the kind of rustic look, but you could have it on the backside. 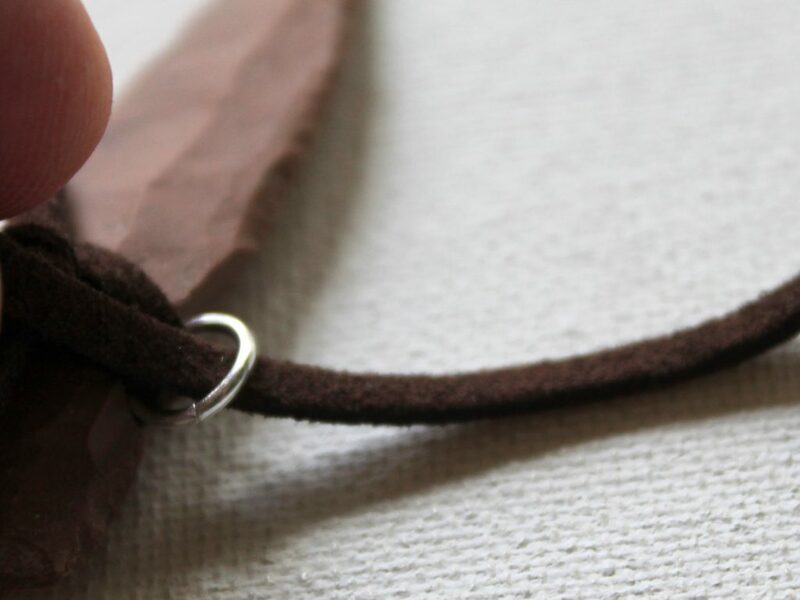 Wrap the 22 gauge wire around the leather cord. 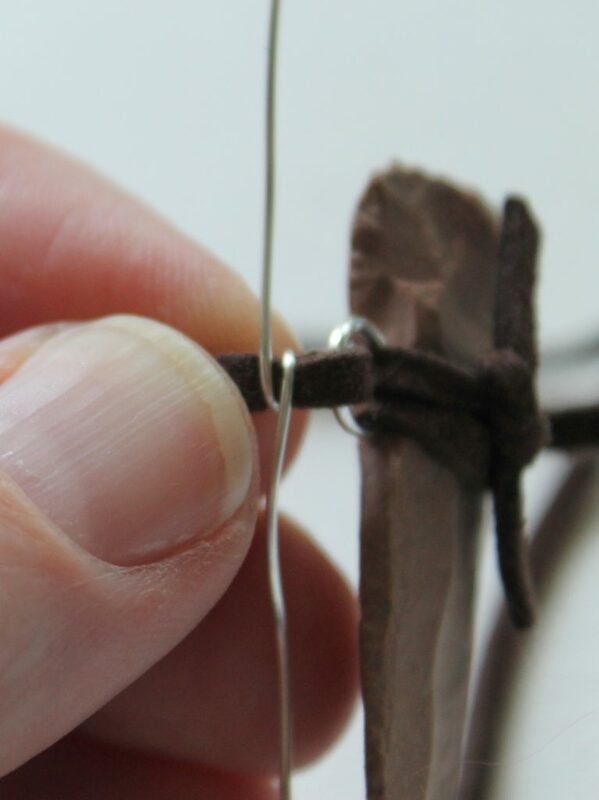 I hold about an inch or so of the wire in one hand and make the wraps using the other hand. 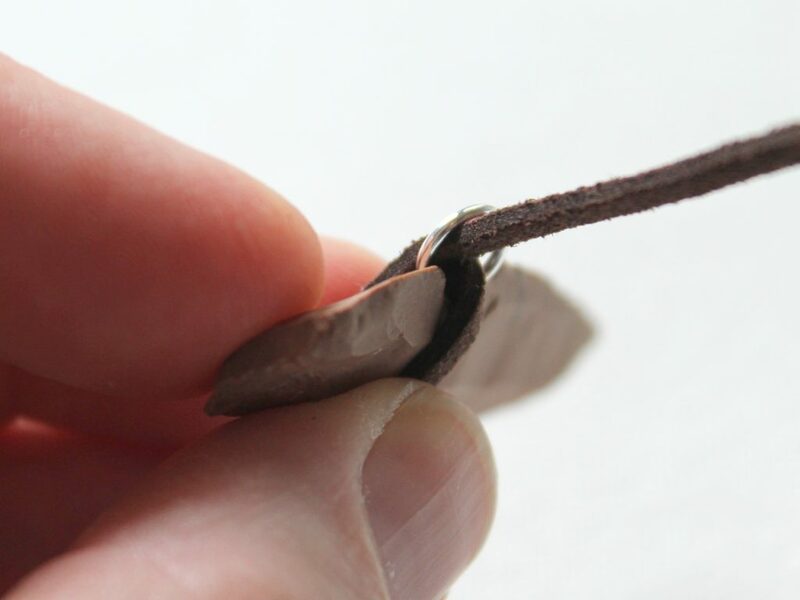 Make the wraps tight and make sure they are holding the cord together and sturdy. 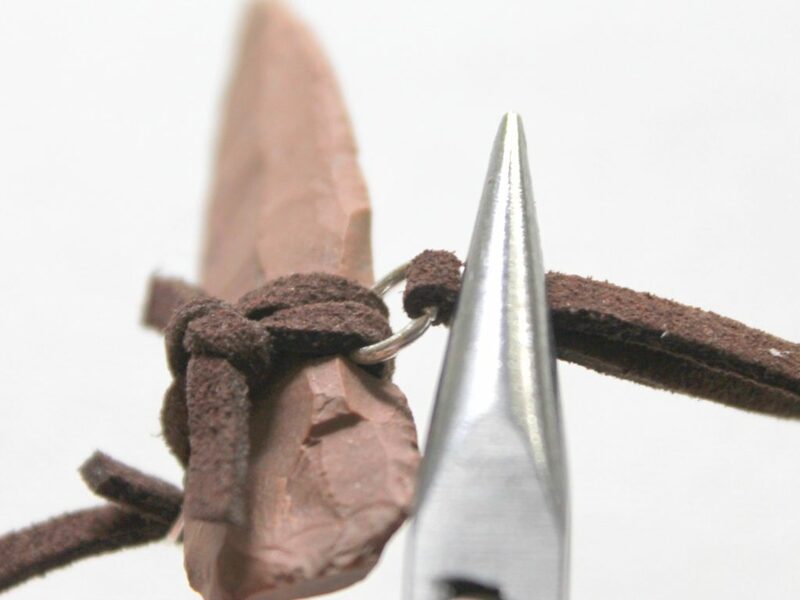 Hint: If your wraps are not close together, use your chain nose pliers to push them together. 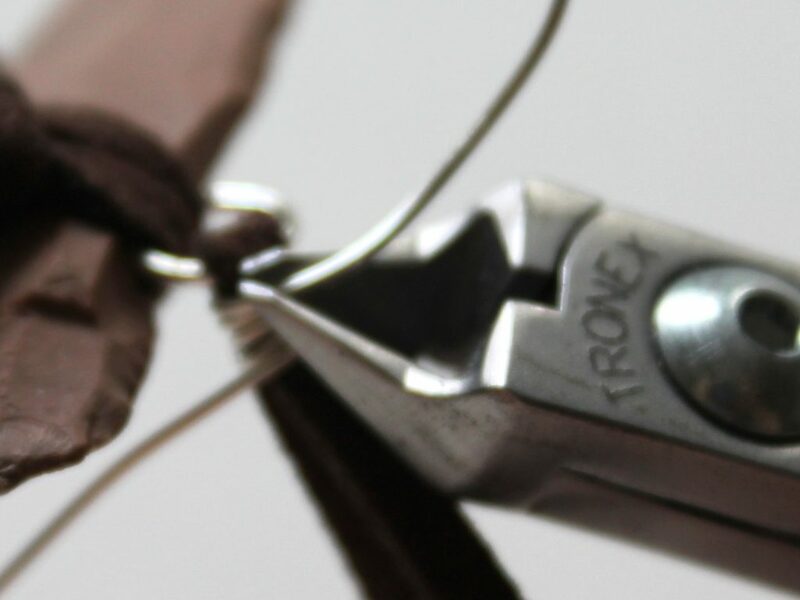 Pull the short end across the leather and then cut off the excess wire. 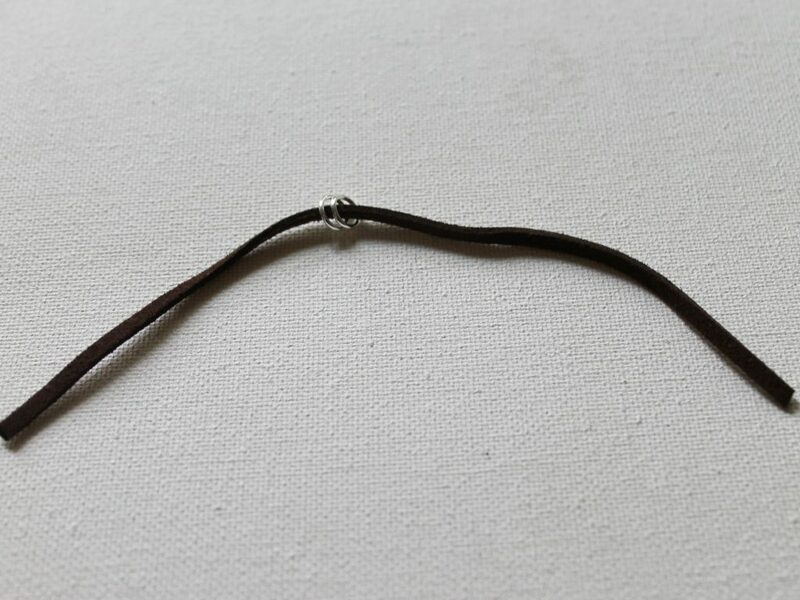 Cut it off in the middle of the cord on the top to lessen the likelihood of scratching your neck. 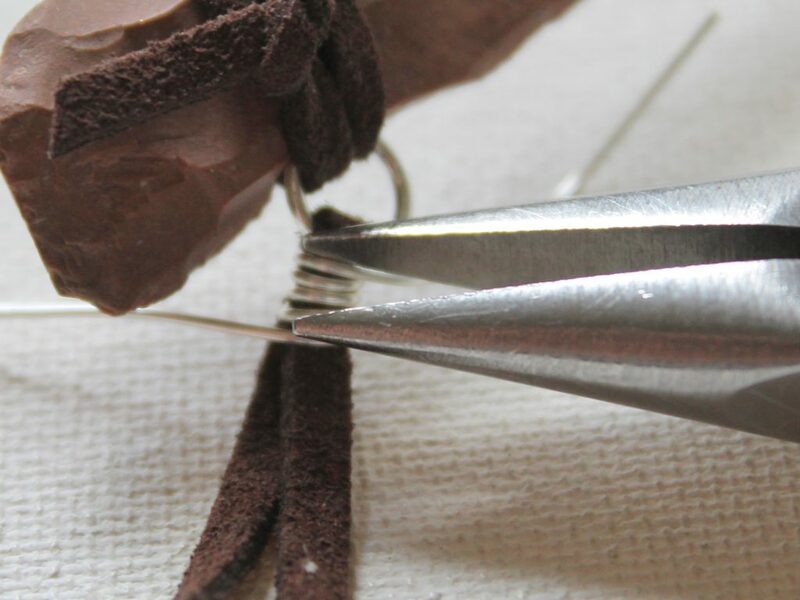 Use chain nose pliers to push in the ends of the wire so they’re not poking out. Trim off the excess cord. I like to leave a little above the wire wraps, but you can trim it as close as you like. Repeat for the other side as well. You could just tie the cord around your neck and be done. 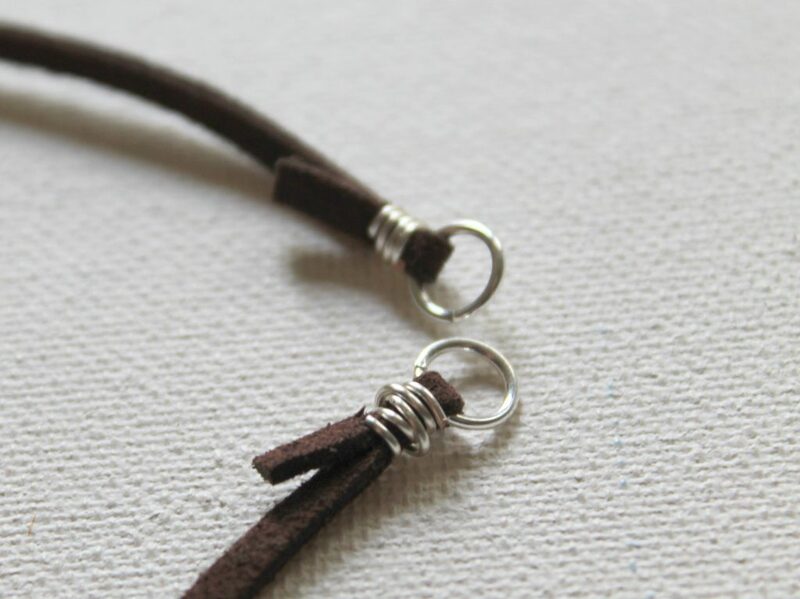 Or you can add a clasp. To do that slide a jump ring on the end of the cord. 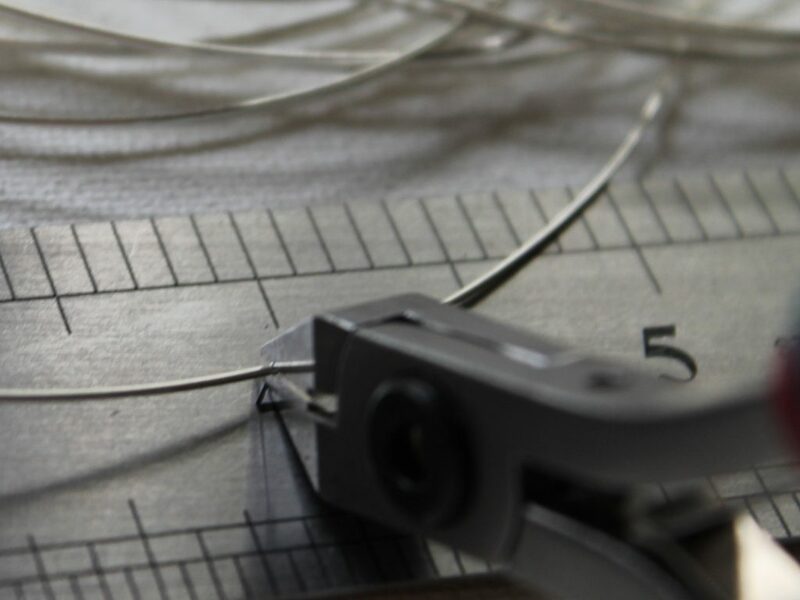 Repeat Steps #6 – #11 to make a wire wrapped crimp to hold the jump rings on each end. Add the clasp using a jump ring and I like to add a second jump ring to the other side to finish the necklace. And that’s the finished necklace! 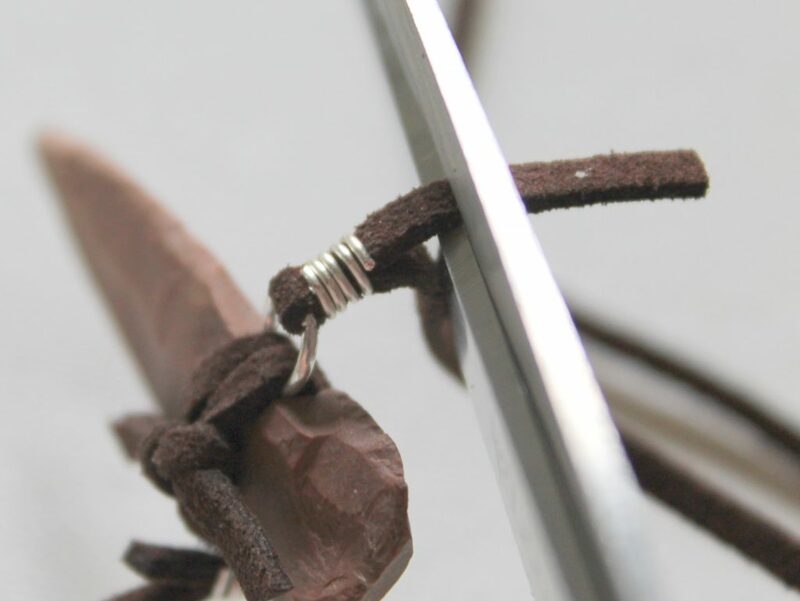 You can use the wire wrapped crimp cord technique anytime you’re using a cord! 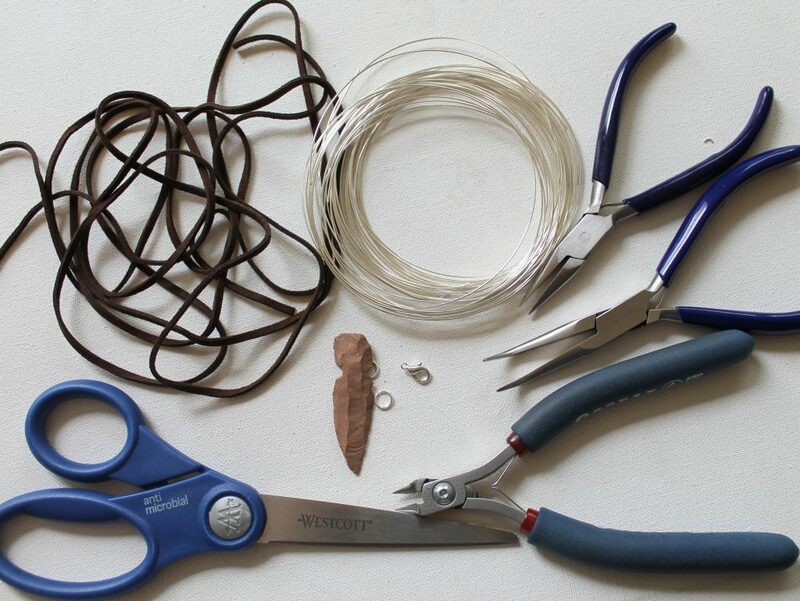 Want to get more creative in your jewelry making? 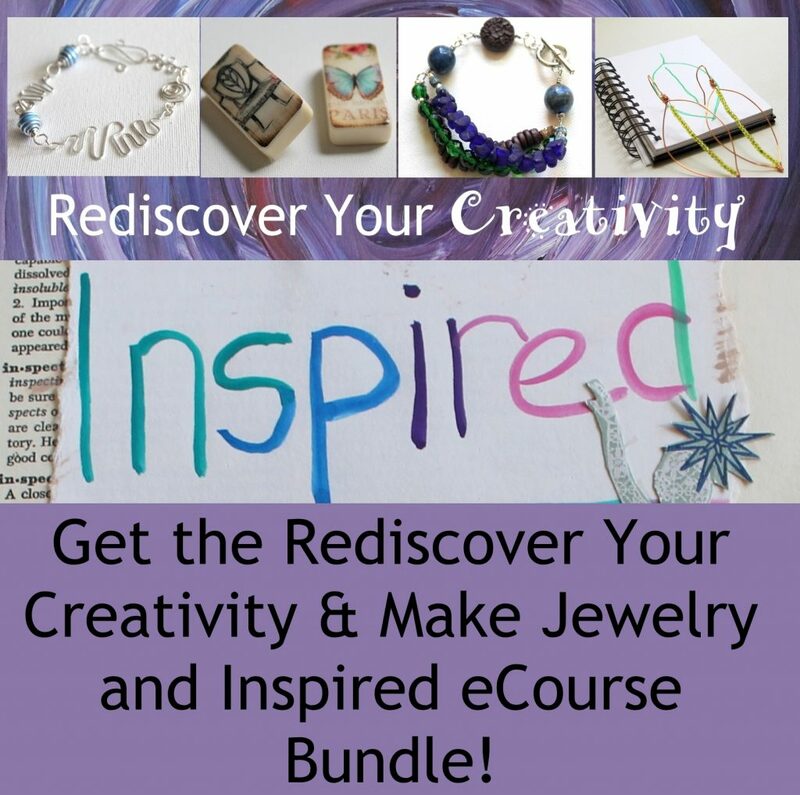 I’m now taking registrations for my eCourse, Rediscover Your Creativity & Make Jewelry! It’s a 6 week eCourse that includes creativity boosters, jewelry making skills and jewelry projects all designed to help you rediscover or boost your creativity. Rediscover Your Creativity & Make Jewelry eCourse starts on June 6th. Find out more and sign up here: Rediscover Your Creativity & Make Jewelry eCourse. 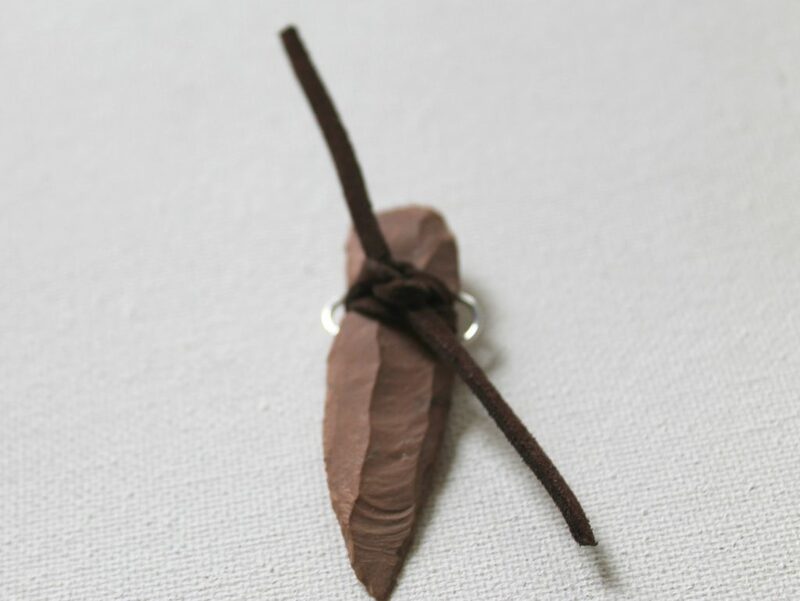 Or you can try my Inspired eCourse that starts immediately after Rediscover Your Creativity & Make Jewelry. Get creativity activities and art journal prompts, make art journal pages, take inspiration from those pages to inspire your jewelry making. 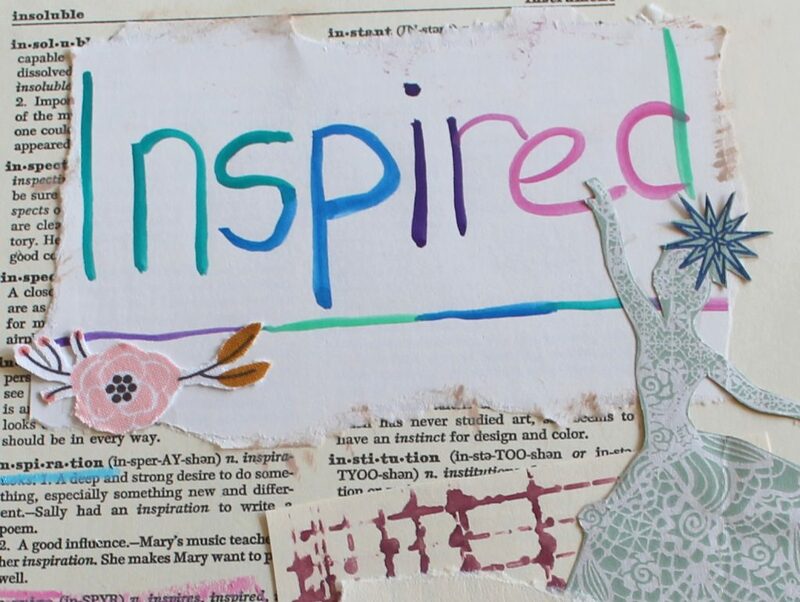 Inspired eCourse starts on July 25th immediately after Rediscover Your Creativity & Make Jewelry. Learn more and sign up here: Inspired eCourse. Or get both for a discount! Learn more about the Bundle here: Bundle Deal. 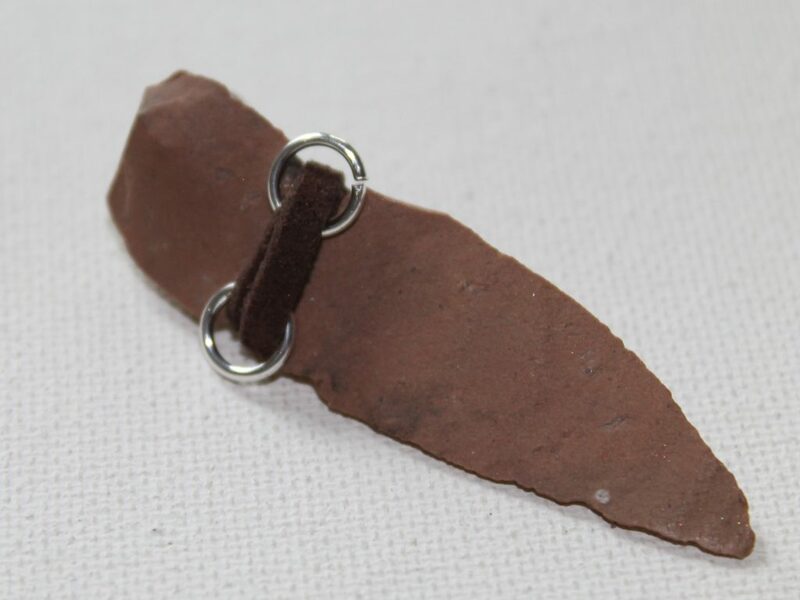 This entry was posted in ECT TV, How to Make Necklaces, Jewelry Tutorials and tagged arrowhead necklace, crimp end, ECT TV, how to make a necklace, how to make jewelry, jewelry diy, jewelry making, wire wrap by Kimberlie. Bookmark the permalink.